Firstly a disclaimer. I am not a SharePoint Professional. 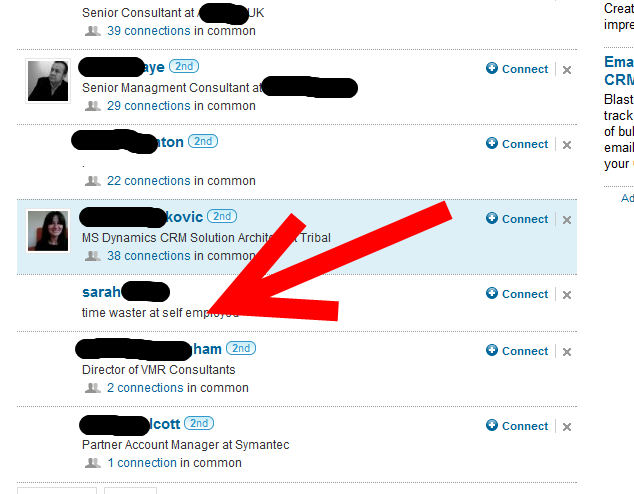 Dynamics CRM is my pitch so I have no deep knowledge or axe to grind on this subject. This post was prompted by a very interesting discussion over on Marc Anderson’s Blog entitled SharePoint Is Going Away – Another County Heard From. Now Marc IS a SharePoint Pro and an MVP to boot so I respect and largely agree with his opinion. In Marc’s post he identifies that there will come a point, either suddenly or gradually, that SharePoint as a product will come to a natural end of life. He identifies that there are a whole range of issues and questions about how the SharePoint brand will evolve. I want to just add my perception (and only mine) to the discussion. And probably a dozen or more besides. The problem this causes is that in response to the question “What is it” the only answer is “It Depends” or even worse “What do you want it to be?”. This is NOT a value proposition that can be easily taken into a business. As SharePoint has grown its feature set and swallowed up other technologies it has become so big that it is no longer possible to define what the technology does in a business focused manner. So my take on where SharePoint will morph to is that it will fade into the background as a brand at Microsoft to be replaced by a set of Modular “Products” that will sit on the foundation of what is now SharePoint. We will move to a place where there will be a “BI Portal for SharePoint Foundation”, “Document Management for SharePoint Foundation” etc. This will allow Microsoft to then segment their market based on the number and type of modules available and the price of each module.. E.g. Free = 4 Modules, Pro=8 Modules, Enterprise = Unlimited. The key difference is that businesses can be presented with a specific module with specific functionality to solve a specific business need. I know that this is how many of the successful SharePoint consultancies have achieved their success but from the Microsoft Point of View this approach allows them to extend their penetration into the partner ecosystem and continue to drive the take up of the underlying foundation which is tied to the wider Windows “stack” and that is their core goal. Microsoft have released a new component for Visual Studio called LightSwitch. This is a set of tools that is designed to allow semi-technical users to easily build user interfaces to databases using Silverlight. I have been following this product through its beta phases and I believe that it will make a massive impact on the on-premise Dynamics CRM world. The reason I feel this way is that there is a new licencing option available in Dynamics 2011 that is the Employee Self Service CAL (ESS). The ESS CAL allows users to interact with Dynamics CRM 2011 but NOT to use the native UI. So what better way than through an easy to build Silverlight application? The same applies (to a lesser extent from the UI capability PoV) to external users licenced under the External Connector Licence. So if you have not looked into the LightSwitch capabilities, you should. One of the great things about Dynamics CRM is the huge ecosystem of developers and partners who extend the toolset that is available for the platform. Many of these toolsets appear in the Dynamics Marketplace but many of them are released under open source licences on CodePlex. An example of these tools is the View Replicator. This lets you build a view and the layout of a view and then replicate it. There is a walk through on Donna Edwards’ blog. This is one of a number of great tools that Tanguy has written and really add to the power of the Dynamics CRM platform. There are instances where the Dynamics CRM 4 Outlook Client can start to be a network and server hog. This is a great post by Jon on some of the areas to investigate when diagnosing this. Whilst Dynamics CRM 2011 is available as a Microsoft hosted Cloud offering there are still a number of clients who have deployed it as an in-house solution. For these clients there is now a key component available to them. The ability to monitor and manage their deployment using the same toolset that they use on the rest of their infrastructure, Microsoft System Centre. In fact this is the same toolset that Microsoft use to monitor and manage their own global data centres! Now there is a monitoring pack specifically designed for Dynamics CRM 2011. It can be downloaded here. The key features of the pack are really impressive and should be part of any in –house deployment. Microsoft Dynamics CRM is very agnostic with regards to the email platform that it works with. Whilst it will of course work very well with Exchange it is happy use any email platform through the use of a separate component called the Email Router. 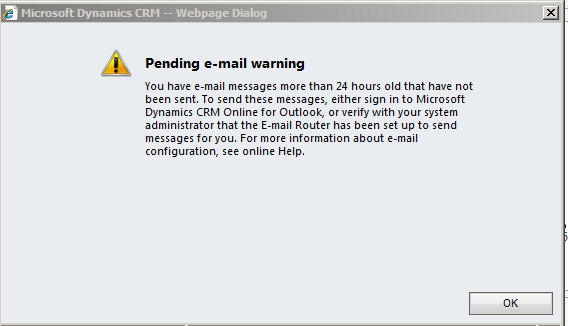 This was warning me that I had created emails in CRM but that CRM had not been able to send them. No surprise as I didn’t have any email set up but it is nice to know that if there is a problem Dynamics CRM will warn you and not leave you blissfully assuming that your business critical email had been sent when it hadn’t. I came across and interesting foo baa today. I have a demo machine that was built using the Release Candidate version of Dynamics CRM 2011. For a number of reasons I had not yet got round to updating it to the RTM version and it had Windows Update running. Because it was running as a demo machine on the RC version it did not have any product keys added. Today I fired it up and found that the Outlook client was totally bust. The toolbar would not load and opening a record caused an error. After a lot of hunting it turns out that the Outlook client had been updated by Windows Update BUT because the Server did not have a product key it had not been updated. As soon as I added a product key Windows Update detected it, downloaded the update to RTM and after a reboot all was well again. Without good data any CRM system is worthless! An obvious statement I know, but as I have just posted over on our company blog, I have lost count of the times clients, past and present, have told me that their data quality prevents them from doing what they want. Data has been imported from spreadsheet to system to system without any rigour being applied. So if you are planning an upgrade to your CRM syste m then you really should be looking at not just the quality of your data but also the breadth of the data. There are a number of companies that have services that will take your data, clean it and add additional data to it. Another important thing to consider is how you are going to keep your data clean going forward. Having got your information in a clean state is this the time to implement some system enforced rigor to your data entry. Again there are a number of solutions out there that provide add-ins for Dynamics CRM that will allow users to look up addresses and populate the system with not just the address but also the additional information that comes with it. So, lets make 2011 the year of clean data. The Microsoft Dynamics Team have released the on premise and partner hosted software. What is surprising is that this has been released 2 weeks early as the expectation was that it would be released in March. What was also interesting is that this was the first major software release by Microsoft, to my knowledge, that went live in the cloud before on premise. Now my supposition is that this was in part to show their deep commitment to the online platform and to send a clear message about their commitment to CRM online, but it had an additional advantage that they could ensure that all the performance tweaks that come with any new software could be monitored and checked in their own environments where they had control and performance monitoring tools available. The good news I take from this early release is that the experience Microsoft has had has not had any nasty surprises and that the software will run as well onsite as in the cloud which is good news for all.